round, because soccer fans never stop routing for their teams. 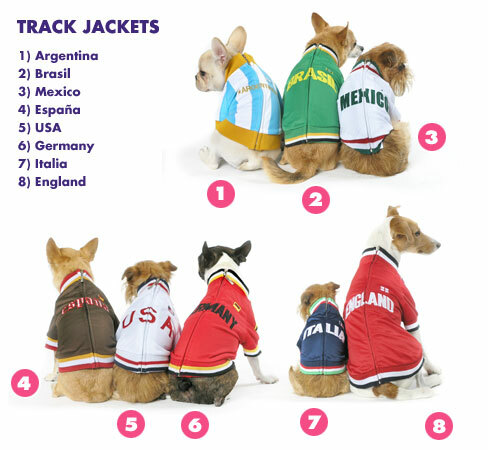 Trixie + Peanut have designed jackets for dog fans of 8 countries - Argentina, Brazil, Mexico, Spain, USA, Germany, Italy, and England. Most of these teams are in the top ten teams according to the experts, although the U.S. barely squeaked in at number 10, and Mexico didn't make it. Nevertheless, in 30 days who knows what will happen? So, pick a country and make your dog a 'World Pup' and he can show off his Track Jacket all year round and make the other pups drool.